April new home sales in the US increased by 6.4 percent compared to March, says the US Census Bureau. A total of 433,000 new single-family houses were sold in April, compared to 407,000 in March. Economists had predicted April sales would reach 420,000. However, April new home sales were 4.2% below the total registered in the same month last year. The housing market has moderated over the past 12 months. The latest April figures are encouraging and a possible sign of another rebound. New home sales make up a tiny part of the US housing market, and are subject to major adjustments. However, they can provide some useful data because figures report on sales at the moment a contract is signed rather than when a realtor closes a sale. The median sales price of new homes was $275,800 in April 2014, and the average sales price was $320,100. The median is the number where half the houses are lower in price and half are higher, while the average is the total of all house prices added together, then divided by the number of houses. The average and median numbers are often close, but usually not the same. Is the US housing market rebound back? According to the National Association of Realtors (NAR), existing-home sales increased by 1.3% to a seasonally adjusted annual rate of 4.65 million in April, compared to 4.59 million in March. In February, sales had slumped to an 18-month low. However, compared to April 2013’s 4.99 million-unit level, April 2014 was 6.8% down. At the end of April 2014, total housing inventory climbed 16.8% to 2.29 million existing homes available for sale, representing a 5.9-month supply at the current pace of sales, compared to 5.1 months in March. Unsold inventory is now 6.5% higher than at this time last year when there was a 5.2-month supply. 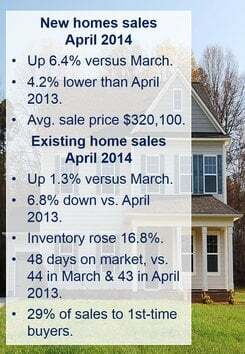 The median price for existing homes stood at $201,700 in April, an increase of 5.2% compared to April 2013. The median price in Q1 2014 was 8.6% higher than in Q1 2013. For the fourth month running, properties sold more rapidly in April 2014, reflecting a prolonged lag in inventory vis-à-vis demand. The median time all homes were on the market in April was 48 days, compared to 55 days in March and 43 days in April 2013. Frieddie Mac data showed that the national average commitment rate for a 30-year, conventional, fixed-rate mortgage was 4.34%, the same as in March but higher than April 2013’s 3.45%. First-time buyers represented 29% of all sales in April, compared to 30% in march and 29% in April 2013.